Round time entries up or down to the nearest minutes or hours so your reports are nice and neat, without all the confusing details. For example, you can round time to a nearest whole minute in reports so you don’t get distracted by seconds when looking at a report. Or, you can round time to nearest 6 minutes and export them to get all time entries displayed as a nice round number with just one decimal. To round time entries, go to any report, click the cog icon, and choose “Rounding – Yes”. Time rounding is an extra feature, which you can enable by upgrading your workspace. Time rounding only affects the reports and can be turned on and off as you wish. Calculating duration: Clockify will first round duration of each time entry, and then add them up. Export: durations and values will be rounded in the export too. 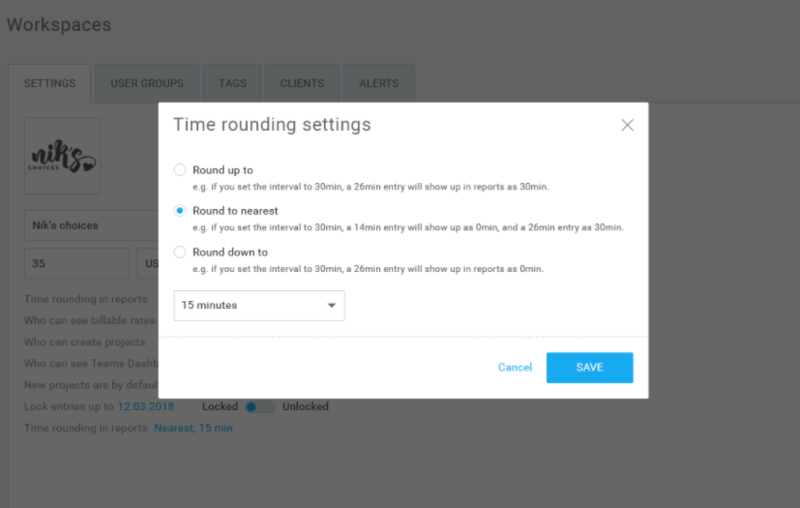 Calculated earnings: when calculating the value of your billable hours, Clockify takes rounded time entries. Detailed report: you can’t edit time entries in the Detailed report when the rounding is on. Time rounding doesn’t change any data, only how it’s displayed, which can always be turned on/off. If you set rounding to the nearest minute, your 00:10:56 time entry will be displayed as 00:11:00 once you turn rounding on, and go back to 00:10:56 when you turn rounding off.